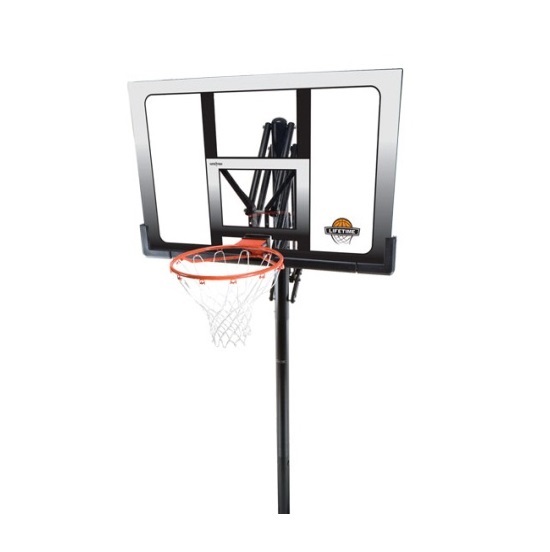 The 71281 is an in-ground basketball goal system constructed of weather resistant materials like powder coated steel and a 52" UV protected Shatter Proof Makrolon Polycarbonate backboard. Makrolon Polycarbonate makes the backboard virtually unbreakable and many times stronger than acrylic. 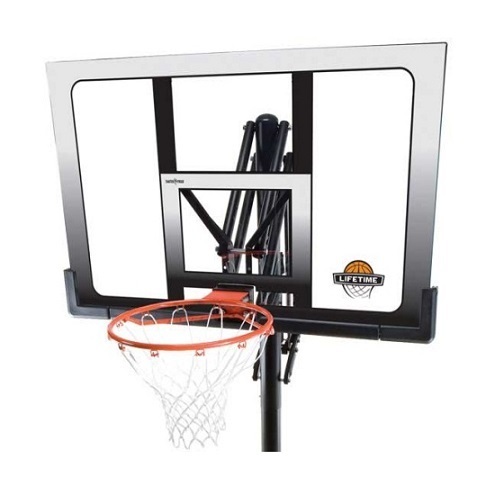 The steel backboard frame improves the rigidity of the backboard, which also improves rebound. A Slam-It rim with double compression springs allows for competitive dunking or friendly competition. 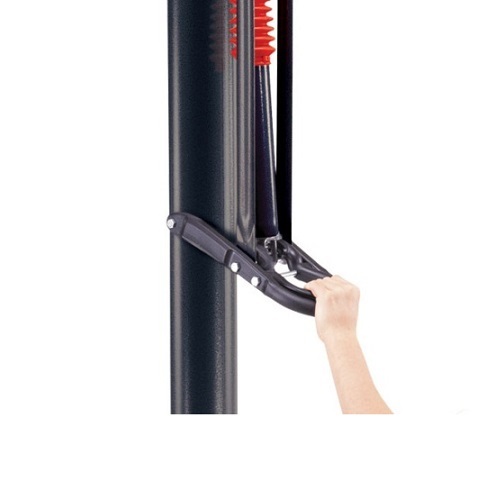 Power Lift Adjustment mechanism allows for easy height adjustments with just the squeeze of a handle so the whole family can play with this system for years to come. This basketball systems is also available as a portable basketball goal system model 71286. A major difference among Lifetime Basketball goals is in the frame of the backboard. Lifetime produces 2 different types of basketball backboard frames. One type is a plastic frame; and the other is a steel frame. 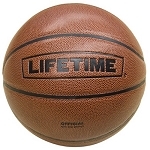 In some cases, two different model numbers of Lifetime basketball hoops will appear to have very similar specs with very different prices. If a customer notices a stark difference in price like this, the difference is typically due to a difference in backboard frame material, steel being the more expensive option. 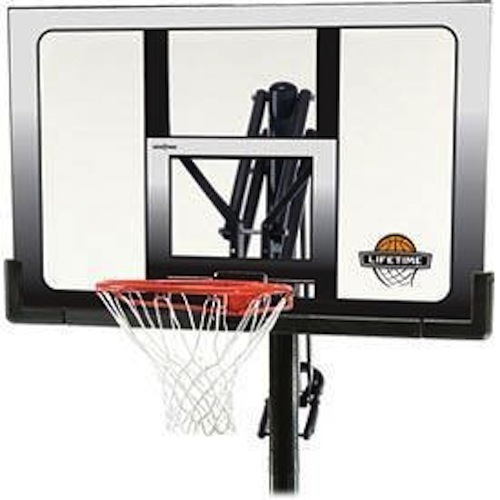 The Lifetime 71281 basketball goal has a steel frame. Competitive Edge Products, Inc. is an authorized retailer of the Lifetime 71281 In Ground Basketball Goal System. Dimensions: 52 inches W x 33 inches H.
Backboard frame: 1 inch steel. 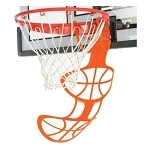 Comes with a regulation-diameter, 18 inch slam-it rim and all-weather white net. This rim uses a double-spring mount to help hold up to aggressive play. Pole size: 3.5 inch round. Shipping dimensions: 54.5 inches x 34.31 inches x 5.69 inches. Great product and super fast shipping. Have put you in my favorite sellers! Great transaction. Highly competitive price. Free shipping added bonus. We were not disappointed at all with the quality and easy of putting together and installing this basketball goal. It is a very good product. your site came to me from someone who purchased what I wanted they were extremely satisfied with your service and products. Best price anywhere for this basketball system. I was hunting for a basketball goal to replace a broken one for my son when I ran across this site. This goal was on sale and over $100 less than other stores. It seems to be a quality goal. It was very easy to assemble. You have to wait three days for concrete to dry, but that is the same for most goals. The pole and backboard brackets are much stronger than the goal I was replacing. I am expecting many years out of this goal. Fast And Free Shipping. Great Product! Thanks A lot! Q: We want to replace an old backboard and hoop but the exiting pole is square and the mounting piece the comes off the back side of the backboard is square also and slides over the pole. Do you have any mounting hardware that might work in this fashion? I believe the square pole is approximately 3.5 - 4 inches wide. A: We carry backboard and rim combinations and brackets are available for them that allows them to attach to 3.5" round poles or 4 in. square poles. Q: Can you get parts for the permanent goals? A: Please call 1-800-225-3865 to get replacement parts for this basketball system. Q: How good is Polycarbonate? A: Backboards are measured in their ability to rebound, the better the rebound, the more expensive, and the higher the quality. Polycarbonate is the cheapest and has the shortest rebound, Acrylic is more expensive with a better rebound, and glass is the most expensive with the best rebound. Q: How does this ship? A: This product ships directly from Lifetime Products in Clearfield, UT. This item ships via FedEx and may not require a signature. Q: What is the distance between the pole and the backboard? Q: does this accommodate the pro slam rim I recently purchased? A: As long as the rim you purchased is Lifetime brand it should work find. Feel free to contact us with any other questions. Q: How can I get just the pole if I already have the backboard? A: You can obtain it by calling 800-225-3865. Q: How difficult is assembly? A: Most customers assemble their systems themselves without a problem. Some handyman services may be available in your area to assist with assembly if needed. Assembly is best done with at least 2 people working on the product together. Lifetime Products does have a customer service line with representatives that are trained in installation questions that can also be of assistance. 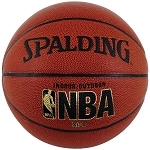 Fast Shipping: Orders for the 71281 Inground 52" Lifetime Basketball System generally leave the warehouse the next business day.